Another first this weekend here in southern Spain: a First Communion. As you know, I give private English classes here in Sevilla and one of my students is a 10 year old girl who I adore. Several weeks ago she invited me to her First Communion and I was eager to accept such a gracious invitation. I came down from Madrid late Friday night and woke up early Saturday morning for what would be one of the longest events I’ve ever witnessed. After a morning without electricity, I wander out into the already warm neighborhood and catch a bus to Los Remedios. The C2 runs toward the Prado bus station and beach goers are the only ones joining me for the ride. I find the school and therefore, the church, without difficulty. Ducking inside to beat the heat I settle into a pew toward the back. The church is large, and simple. It is a welcome relief from the ostentatious cathedrals and eye popping Gothic gold that usually accompanies a Spanish iglesia. 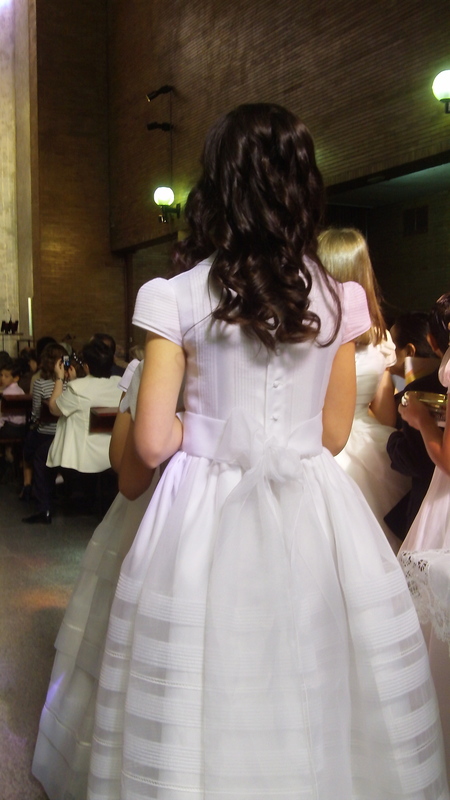 As one would expect, the First Communion has very little to do with religion and a whole lot to do with socializing. I watched people of all ages file into the church, dressed in their summer finery. I shrug off my wrap once I see other people with bare shoulders in the chapel. There are two kisses on every cheek and cameras, video cameras and parental paraphernalia galore. I spot my student’s sister and parents and settle down to wait. By some beautiful miracle, it looks like we will start on time. I am informed later on that this is because the church turns out two communions every Saturday in May – one at 10 a.m. and another at 12 Noon. Whatever the reason, on with the show. 10:03 a.m. here’s my girl! My student walks in, looking like a mini bride in her brilliant white dress. She is at least a head taller than her classmates and I make a mental note to start talking about volleyball with her – as if she has time for another activity besides her English, dancing, painting, horseback riding and basketball. I am surprised to see a small class – only 16-20 students. Her dad tells me later that it is typical to do several ceremonies with less students, rather than what I’m used to seeing in the US. The church is packed and there are less than 2 dozen kids, so obviously the organizers know what they’re doing. Fast forward: 11 something a.m. I sat in the right spot! 11:40 a.m. where is the organ? Another surprise here in a Spanish church is the lack of the monster organ and the ominous hymns. Near the front sit three singers, a guitar player and a girl with a tambourine. This lends a folksy sound to the ceremony, and accompanies all of the religious songs in a way I’ve never heard before. The congregation sings along and does the hokey pokey when they’re supposed to, and at last we are done. The poor usher is shooing people out of the aisles as they try to walk the children down to the front door. The resulting sprint for the central aisle is chaos. I’ve found my student’s family, told my kiddo she’s beautiful and we disembark for a drink at a private club along the river. At this point, we are about 15-20 people. Family, friends, and cousins out the wazoo. The children are amazed that I’m in attendance and that I speak English. There are a lot of “how are you” and “where are you from” -s going around. All this with the backdrop of the Rio Gaudalqivir and a blindingly sunny day. Half serious and half joking, there have been several references to “la novia” – literally – the bride. Regardless, she is the star of the day and since we arrive in the same car, it’s ok that we’re late. After all we had to go upstairs and say hi to the dog before we left. 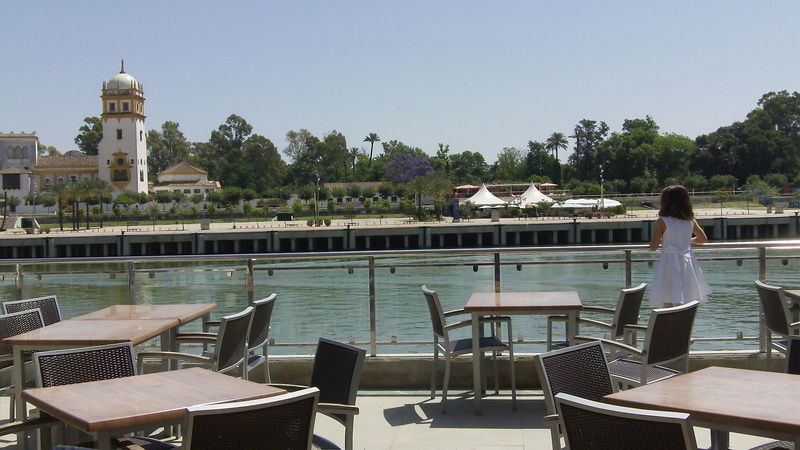 There is a beautiful restaurant in front of us, with a typical Andalucian patio and goldenrod colored walls. Through a big wooden door I see a few tables and realize that this site has been reserved just for us. In the end we will be approximately 40 guests. The kids get their own table outside and they happily gnosh on tapas and later, fish and chips. They are high on coca cola and oohing and ahhing over the gifts. There is an ipod, a camera, a Nintendo DS, ipod speakers, and gift cards like whoa. I gave her a bag full of what she likes best – crayons, markers and pencils. Most importantly – imported from America. (Thanks, Mom!) Crayola is a big hit, and the kids exclaim left and right about this super cool American gift. Who needs an ipod when you can have crayons, right? After over an hour of butlered hors d’ouevres we head into the dining room. We start with salmorejo and ensaladilla which is cool and delicious. The highlight of the night is when they open the large wooden door to allow not one but two people to carry in the biggest pan of paella I have ever seen. It is probably the size of the dining room table in my apartment, and damn – it is GOOD. My student is the epitome of creativity, and has organized a list of games for her friends to play. There are sack races and sponge races and a water balloon toss. At the end of the day there are 5 scraped knees, all girls. My student has shed her bride’s dress for a sensible pink sundress and is running around like a maniac. Her mom has plugged in the laptop and started a karaoke program, which the adults seem to pay more attention to than the kids. Yes, we are still here, now 12 hours since I left my house. We have moved to the patio and now the dads have their ties and jackets off and everyone is taking a turn jumping rope. One woman jumps in with her fire engine red high heels on and does even better than the guys in their dress shoes. I take a spin or two myself, holding on to my dress and trying to keep up with the younger cousins. The restaurant staff (all 3 of them) start cleaning up inside and we start making noises about heading home. This doesn’t happen for another 50 minutes, but we make a good effort and pack the cars. I have 5 missed calls on my phone because we are having a party back at my apartment and it started about an hour ago. By the time I set my foot in the house, it’s 11 p.m. and the party is roaring. All throughout the day, my student and her family kept checking in on me, making sure I was eating – drinking – having fun. Their friends and family were so welcoming, it was an absolutely pleasure to be a part of this event. Driving home at the end of the night, her mom asked me if it was a long day. I said no.. it was a full one. Feria pa’ to’. (In actual Spanish: Feria para todos / Feria for everyone). I finally found it .. the feria that exists for the general public and not just the wealthy private citizens. Want to know where it is? Calle Infierno – the place where all the attractions are. While we did not partake in any of the rides, we had a grand old time watching the kids in their flamenco attire ride the Toros Sentados and la noria (ferris wheel). This was far more appealing to me than the casetas. There, I said it! They had every ride you could imagine, just steps away from the casetas, caballos and manzanilla (tents, horses and wine). Let it be known that the Sevillanos have no concerns about getting on a wildly spinning ride while dressed flamenca. I say, bravo – hold on to your flower, señora. There were several stand outs amidst the explosion of colors, lights, smells and sounds. One – the ponies. Sadly, they were hooked up to a small wheel and had to walk around and around like a carousel. I hated it on sight, and I don’t think the ponies appreciated it either. Two – the large and small versions of literally everything, as well as the repetition of rides. If your 6 year old wants to get in a bumper car, he has at least 5 options with different styles, music and lights. Three – the lottery ticket system for prizes. As always, the Spanish remain lottery crazy, and it turns out Feria is no different. Our favorite of the four or five ginormous booths was giving away legs of jamón, bottles of wine, loaves of bread and cheese. The ham legs really set the precedent. Who needs an iphone if there is ham to be had? and four, let’s give it up to the giant Native American figures outside the Enchanted Forest. They made me think of Dane Cook’s skit about 80 foot tall Indians… coming to get you, Spain! My last tour around Feria (four nights in total) involved festival food – which shocked me. After hearing how expensive food could be, and seeing a 9 euro charge for a jarra of rebujito, I was fully prepared to leave the fairgrounds in search of nourishment. Not so! In the last row by the crane games sat a series of stands with hamburgers, hot dogs, ice cream and YES – kebabs. A kebab, some fries and a beverage came out to 5 or 6 euros in total. One happy stomach and an excuse not to get on the wildly spinning ride with the neon lights.